We have updated our Sport Premium report. If you should have any questions or suggestions about sport at Wylye Valley, please see Mr Barnes (Head Teacher). Well done to the eight boys who represented the school so well. Well done to all of the children who represented Wylye Valley at the Cross Country event. 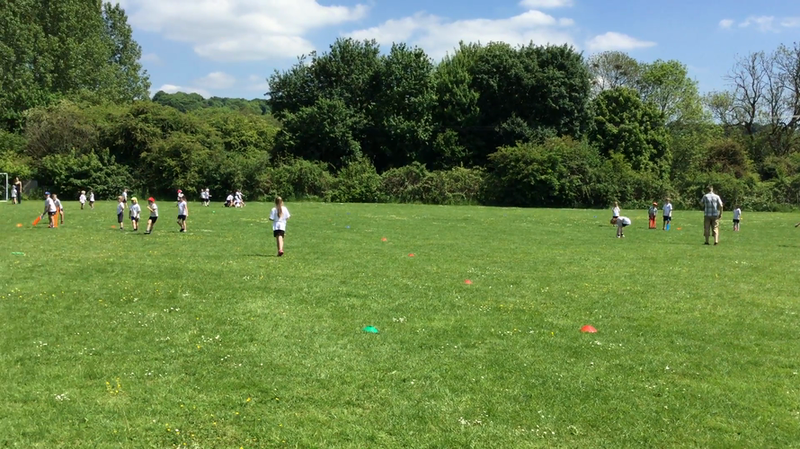 They did themselves proud, with the Year 3 and 4 having to run a 900 metre course and the Year 5 and 6 children having to run a 1300 metre course. In total, there were ten local schools competing. In both of the girls' races, we achieved two individual first place finishes, which was fantastic. Thank you also to all of the parents who attended to cheer on their children and support the school. It was great to welcome Crockerton to our school to play in a Tag Rugby match. A high scoring game, with lots of good quality rugby from both teams, ended with a 18-9 victory for Wylye Valley. Thank you to PH Sports for organising and refereeing the match. We hosted our largest Rural sports event this year with 6 schools competing in various track events across both Key Stage 1 and 2. Thank you to all the schools who came to Wylye Valley and joined us for the day: Crockerton, Heytesbury, Horningsham, Chilmark and Great Wishford. Key Stage 2 events were held in the morning, with Key Stage 1 competing in the afternoon. In total, there were about 430 children at our school across the day. Well done to all competitors for making it a great day. Thank you also to all the staff from the schools who made the day possible. We hope that parents and relatives who came to cheer on their children enjoyed the festive atmosphere at our school. Well done to the Year 5 and 6 children who competed at the Quad Kids Athletics event held at the fantastic Bath University sporting facilities. With the hot sun pounding down upon them, they gave their best in the different events - 75m sprint, 600m run, Vortex throw and Standing Long Jump. There were many schools there comprising of 23 teams. We took two teams and our 'A' team finished 10th overall with our 'B' team finishing 23rd. Following on from the successful event last year, Wylye Valley have again taken part in the 'Race for Life' to raise money for Cancer Research. The whole school community - children, staff, governors and parents - ran the mile (eight times around the track) with many children claiming far greater distances. This was a great event, run with great commitment and enthusiasm. Please can you ensure that any sponsorship monies are returned to the school next week. We will then be able to announce the total amount raised for Cancer Research. Well done to our Tag Rugby team. They played four matches at the tournament where they won one, drew one and lost two of the games. Our school 'A' team played a friendly match against Chilmark. A good competitive match ended in a 7-0 win for Wylye Valley. Well done to all the children who proudly danced in front of 800 people at the Bath Forum as part of the 2017 Dance Festival. We arrived in Bath to rehearse at 3pm and the children didn't leave until 9:30pm so it was a long day for them. The show, which featured Wylye Valley and 16 other schools dancing on the night, was fantastic. Our children represented the school with honour and performed their routine to the song 'Requiem for a dream'. These pictures give an idea of rehearsals, backstage, and the performance. Our Wylye Valley Dance Crew T-shirts were widely admired by other schools there as the children looked amazing. There is a DVD available of the performance and details are on the order form which is attached below. (I will also ensure that there are paper copies available in the office if you ask for one). Members of our Sports Council were proud to receive the School games 'Gold' plaque to recognise our achievement in promoting and particuipating in sport during the last school year. Congratulations to our Key Stage 2 Football 'B' team who won the tournament. After playing four matches, Wylye Valley won the tournament having won three and drawn one of the games. All our children represented the school proudly and showed great sportsmanship throughout the evening. Well done! Well done to the Year 3/4 Hockey team that represented the school so well. After some skills training sessions, they played 4 games in which they won two and lost two. some future stars in the making! The Sports Council introduced themselves to the school and introduced the playground rota for football and tennis. Our levels of participation across a range of sporting activities this academic year have been very high. This documents shows which different extra-curricular clubs we have offered to children (35 different clubs over the 6 terms), participation levels across the whole school and participation levels across Key Stage 2. We are very proud of the high participation levels that are being achieved and pleased to be able to offer the different activities to children. There really is something for everyone. We are proud to announce that Wylye Valley CE Primary School have been awarded 'Gold' status for primary sport provision this year. This has been raised from the 'Silver' award that we gained last year. Thank you to all the children and parents who have supported all of the sporting activities both inside and outside of school. Thank you for turning up and supporting our Sports Day. We had great weather, good competitive events and even ice cream for some. Well done to the parents who were such good sports in the Mums' Race and Dads' Race. Thank you to all adults and children who raised sponsorship money to aid Cancer Research UK. The Race for Life event was a great success, with all the children and staff running at least a mile, and many parents joining in or showing their support. Once all of the sponsorship money has been collected, we will be able to announce how much has been raised. UPDATE: Just over £1000 was raised from this event. Thank you once again to those who sponsored someone or took part. Pre-match huddle for the staff. What a strike! (Shame it's the warm-up). The rest of the school watches on. Ref! Surely that's a foul? You'll never get the ball from her! In the final week of term, the Year 6 children played a staff team. In a competitive match, the staff ran out 6-2 winners.